Velvet Paw Creations: 'Time To Dance' A White Shabby Chic Challenge with Third Coast! 'Time To Dance' A White Shabby Chic Challenge with Third Coast! Here's my project demonstrating the theme! I hope you'll come join us for a chance to win a $25 gift certificate to Third Coast Rubber Stamps! I enjoy playing with white on white layering of embossed and die cut cardstocks and particularly love the depth created by the play of shadows! I used 3 different shades of white on this one! 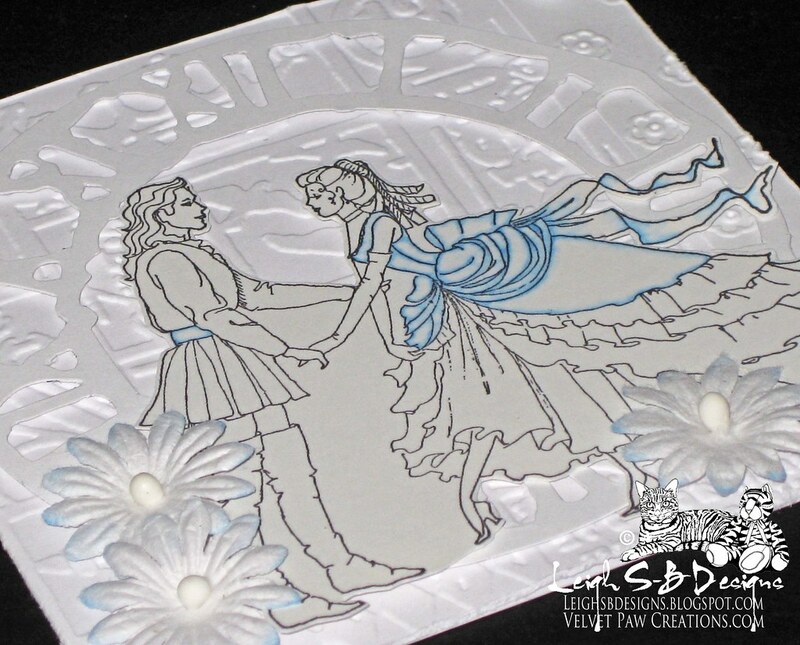 You can have so much fun with this theme and its a great way to use up your off cuts from your cardstock stash too! The background of my card is embossed with Tim's Bingo/Patchwork Texture Fade embossing folder with a narrow panel of embossed Cuttlebug daisies down the right hand side and attached with two white brads. I also roughened the edges with Tim's paper distresser tool. The large Weathered Clock die cut, Tim Holtz' Alterations, is layered on top with pop dots. The image, May I have This Dance? (VB-239-P) by Third Coast, is stamped onto Strathmore Bristol Smooth heavy weight cardstock with Tuxedo Black Memento ink. I chose to add just a touch of Copic B23 and blended it with a Copic Colourless Blender. I also added touches of B23 to the white paper daisies and diluted it with the Blender pen. I completed the card by fussy cutting out the image and adhering it to the card with pop dots and added the daisies with craft glue. I hope you'll come and play with me over at Third Coast Creative Challenges blog and enter TCCC#9 White Shabby Chic! I'd also like to give you a heads up on the next two challenges for this year! Stay tuned for my next two projects featuring the new challenge over at Blockheads Paper Arts too! The new challenge is Clean & Simple! It couldn't be easier to win some awesome prizes! I always like white-on-white cards. 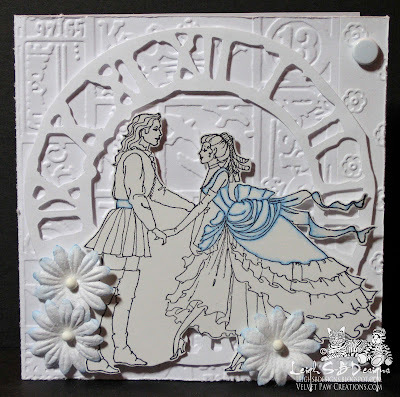 Great embossed background to set off your lovely couple. The flowers are a pretty finishing detail. Thanks for joining us at ATS&M this week! Fabulous white on white card. I like the idea that only a part of the dress is blue. Magnificent embossing. Beautiful layout. Bravo ! It's successful ! Leigh: Your white-on-white card is so pretty--and you used up some of your stash too! Thanks for joining in our "Use Your Stash - Challenge #26" at Simply Create Too. Awesome ideas for how to use some of your stash. I love all the layering. Thanks for sharing and playing along with the Use Your Stash Challenge at Simply Create Too! What a great card. So lovely design. I like the softness of colors and that image is so beautiful. Thanks for sharing. love all of the white, thanks for joining Simply Create!! !